Post-made of titanium, which is imbedded in the jaw bone- like natural teeth. Abutment-Basically the connecting device that anchors the post to the crown. Crown-Usually made of porcelain or Zirconium to have the appearance of a natural tooth. Dr. Funk has taken extra training in implant surgery and has been placing implants for several years. It is important to greater implant success that the titanium metal “fuses” with the jawbone through a process called osseointegration. This is why bone loss is usually not a problem. 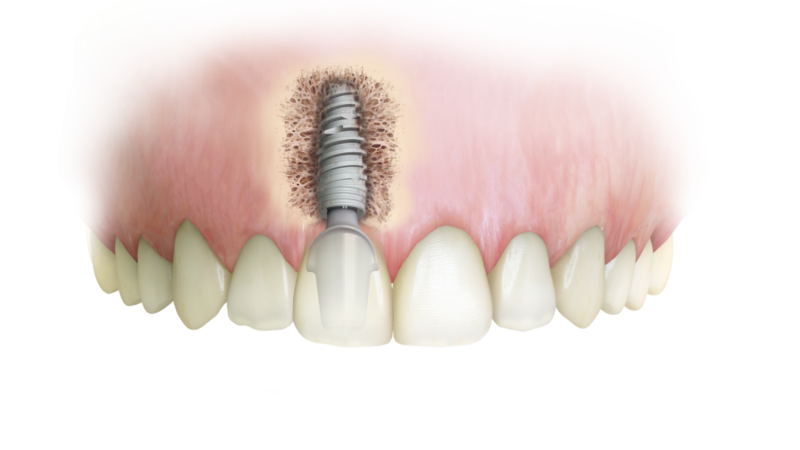 A dental implant is a biocompatible post that replaces the root of your missing tooth. They become the support for a natural looking restoration of the tooth or teeth. A titanium post is surgically placed so it interfaces with the bone of the jaw or skull to support a dental prosthesis such as a crown, bridge, denture, facial prosthesis or to act as an orthodontic anchor. In a few months, the bone will fuse to the post. With current technology and the use of implants, we can support partial dentures and even full arches with complete loss of teeth, with bridges supported by implants. These create a smile that most people with missing teeth could only imagine in the past.